Drawing on real-world examples, book author Wayne Eckerson summarizes the elements needed to implement a successful business analytics program. In this excerpt from Secrets of Analytical Leaders: Insights from Information Insiders, by business intelligence consultant and TechTarget research director Wayne Eckerson, readers will learn about the keys to developing and running an effective analytics program as described by analytics managers at several companies. Eckerson highlights the importance of creating analytical processes that aren't excessively rigid; in the first of three segments from Chapter 5 in his book, he also identifies putting the right culture, people, organization, architecture and data in place as key steps to analytics success. Chapter 5: What are the Keys to Analytical Success? The analytical leaders profiled in this book describe many keys to success. This chapter summarizes their keys to running an effective analytics program, while subsequent chapters dive into greater detail on the themes and subjects highlighted here. Ironically, the analytical leaders spend as much time discussing how to manage people, projects, and processes as they do technology and architectures, which they view as enablers. Specifically, Tim Leonard emphasizes the need to understand the business and talk its language, while Dan Ingle focuses on building applications quickly through agile development approaches. Others, including Darren Taylor and Amy O'Connor, underscore the importance of obtaining strong executive sponsorship, while Kurt Thearling and others emphasize the need of getting a quick win to establish credibility and momentum for an analytics program. And every analytical leader emphasizes the importance of curating data and moving beyond insights to action. Change management. Analytics requires both strong analytical leaders and executives who are willing to make a long-term commitment to its success. Analytics is not a one-time project; it's a program -- or as some say, a journey that requires a long-term investment of time, money, and expertise. It requires organizations to treat data as a corporate asset and invest in building an analytical infrastructure. Moreover, it requires workers to change the way they view and manage data, and frame and make decisions. This involves changing core processes as well as modifying individual and group habits, which is hard to do. Ultimately, as Amy O'Connor emphasizes, analytics is an exercise in change management. Figure 5-1. Analytical Framework: This framework highlights the major areas required to run a successful analytics program. 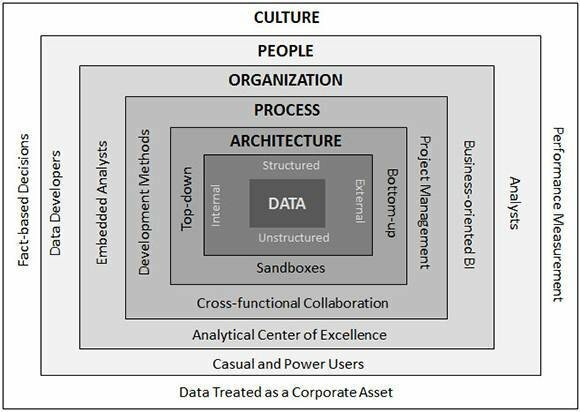 To succeed with analytics, organizations need the right culture, people, organization, architecture, and data. (See Figure 5-1.) This is a tall order. Putting these pieces in place involves more than just technical expertise; it requires an organizational overhaul that has to start at the top and ripple through the rest of the organization. There is as much "soft" stuff involved in succeeding with analytics as "hard" stuff. That's why most of the analytical leaders profiled in this book spend much time discussing selling, marketing, and teamwork as they spend talking about technology and tools. The Right Culture. Culture refers to the rules -- both written and unwritten -- for how things get done in an organization. These rules emanate primarily from the words and actions of top executives. Business executives must have a vision for analytics and the willingness to invest in the people, processes, and technologies for the long haul to ensure a successful outcome (see Chapter 6). Technical executives must be able to talk the language of business and recruit business people to work on their teams. They also need to manage all components of the analytics program, from data warehousing to business intelligence to advanced analytics. The Right People. It's impossible to do analytics without data developers and analysts. Data developers build and maintain the data structures (e.g., data warehouse, data marts, master data management, BI semantic layers) and create complex reports and dashboards. Analysts, on the other hand, explore the data and generate reports and dashboards to answer ad hoc questions asked by the business. Hiring and retaining the right people is not easy. Both data developers and analysts require a passion for data, along with a blend of people skills, technical expertise, and business knowledge (see Chapter 8). This excerpt is from the book Secrets of Analytical Leaders: Insights from Information Insiders by Wayne Eckerson, published by Technics Publications, LLC, Westfield, N.J. ISBN 978-1-9355043-4-4. Copyright 2012, Wayne Eckerson. For more info, please visit the Technics Publications website. The Right Organization. Every company needs to cultivate a federated organizational model to succeed with analytics. Centrally, it needs a center of excellence that establishes and inculcates best practices for building analytical applications and provides a forum for team members to share ideas and techniques. Departmentally, it needs embedded data developers who can quickly build data-driven solutions as well as embedded analysts who can quickly address ad hoc questions. Sometimes, these are one and the same person, but not always. In addition, a federated organization needs to manage shared data as an enterprise resource while empowering departments to build their own reports, dashboards, and analytical models. This dual focus requires some tricky organizational choreography that most companies have yet to master (see Chapter 9). The Right Process. A hallmark of an outstanding analytical program is that it has standard processes and procedures for doing things, such as managing projects, developing software, gathering requirements, communicating across business functions, deploying analytical models, handling job errors, designing and changing data models, evaluating and selecting new tools and technologies, and ingesting external data, among other things. However, analytical managers must be careful not to overburden their teams with too many processes and standards that impede agility and undermine flexibility, as Eric Colson cautions later in this chapter. Part II of this book deals with various analytical processes: managing people (Chapter 10), developing software (Chapter 11), delivering insights and action (Chapter 12), and developing analytical models (Chapter 13). The Right Architecture. Every analytical organization needs tools and technologies to do its work. The ideal architecture creates a data assembly line in which data flows from sources to targets to applications, each tailored to different departments and types of users. It extends existing data warehousing environments with new database processing platforms and complements top-down monitoring with bottom-up ad hoc exploration. It also provides the right tools to the right people so they can generate or consume data-driven insights (see Chapter 17). Finally, it implements agile processes that accelerate software development while maintaining data consistency and models across business units -- a sizable challenge that few organizations have yet to master (see Chapters 11 and 15). The Right Data. Analytics also requires data that is in the proper shape and condition. It must be complete, accurate, timely, relevant, and consistent or business people won't trust it and will stop using it, even if their organization has invested millions of dollars in data-centric tools and technologies. Organizations also need to invest in the right kinds of data -- internal and external, structured and unstructured -- that business people need to answer critical questions. They also need to treat data as a corporate asset that is as precious as cash or people (see Chapter 14). Download a free PDF of this chapter: What are the keys to analytical success?